View OST File Along with Attachments. Preview Emails, Journals, Contacts, Calendars, etc. Add Various OST Files One by One & Preview files in an In-built Viewer. Dual Scanning Mode Option: Quick & Advance Scan Mode. Provides Item Count Display for Each Folders of Selected OST file. Examine OST Files Without Installing MS Outllook. The user can preview a number of OST file along with their mailbox items (Contacts, calendars, task, etc.) Even the software will generate a preview of email attributes such as Sent data, Received data, Subject, To, From and size in bytes which make it eaiser to analyze OST file. MS Outlook OST File Forensics tool provides preview of OST file attachment within in-built viewer. Users are enabled to take a glimpse of emails attachment types such as documents, images, files, and other similar files. As the software is run, it ask you to choose the scanning mode option to analyze OST file and get rid from corrupted OST file. In case if there is minimal quantity of corruption, then go for quick scan mode option otherwise select Advance Scan mode if there is a severe level of corruption in OST files. With the use of Outlook OST File Forensics tool, the user does not need to load any specific email application and then analyze OST files. Forensic investigator is free to use tool without installing corresponding email application. The GUI of the software provides us the feel of MS Outlook Interface. All OST File emails along with their metadata will appear in a resemble way as it appears in Microsoft Outlook. The software has a default screen view is horizontal. Meanwhile, if user needs to view it in vertical mode while examining the OST files, they are free to switch the screen from horizontal view to vertical view. DEMO version allows you to scan, add and preview the evidence available within OST files. If you want use advance search, go for PRO version. 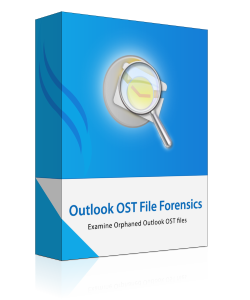 Upgrade to Outlook OST File Forensic Pro for Advance Search. Can I Open and Examine Corrupt File With help of OST file Forensics Software? Yes, the software will allow you to open as well as implement depth analysis on corrupted OST file. Is Coressponding Email Application Installation Required while analyzing OST File on My local Machine. No, You do not require to install MS Outlook on your local Machine to Analyze OST File. Outlook OST File forensics tools hold a really eminence place while investigating any crucial data of OST files; all thanks to the Revove OST forensics solutions that give hand to overcome from the severe level of corruption in OST file. I have a large bunch of OST files around 1.5 GB of data which is highly corrupted and I need to recover this all, Thankful to Revove Forensis tool that not only helped us to detect the corruption from OST file as well as resolve it easily.